Palm Beach Healing Arts is an integrative medical practice in West Palm Beach. We offer the Chinese medicine modalities of Acupuncture, Cupping, Herbal Medicine, Moxa therapy, and Tuina. We also incorporate Functional Medicine, Western and Ayurvedic herbal medicine, nutrition, homeopathy, and injection therapy into our treatments. Our mission is to provide complementary medical care in a safe and nurturing environment to the Palm Beaches. One of our many goals is to foster greater health and wellness for our local community. We strive to identify and treat the root cause of disease rather than simply address symptoms. We also place great emphasis on educating our patients and community about the benefits of acupuncture, healthy lifestyle habits, herbal medicine, nutrition, exercise, meditation, and more. We work one-on-one with you to support your health and longevity, and to help you maintain a vibrant state of health to reduce the likelihood of future illnesses. Katherine Borse is a Florida licensed Acupuncture Physician and is nationally board certified in Acupuncture by NCCAOM. 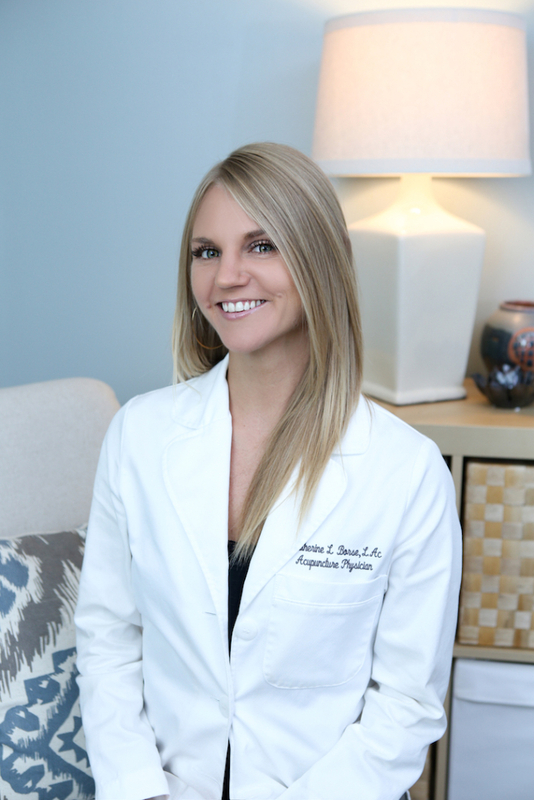 In 2010 Katherine graduated at the top of her class from the Atlantic Institute of Oriental Medicine with a BS in Health Science and a Masters of Science in Oriental Medicine and has been practicing within the Palm Beach County area since. Her first year in practice Katherine was an associate acupuncturist at a busy integrative medical practice in Delray Beach where she began incorporating her study & knowledge of Functional Medicine and Nutrition into her Acupuncture and Herbal Medicine practice, and was fortunate enough to work with and treat several thousand patients, giving her the advantage of working with people of all ages and all scopes of medical concerns. During this time she was also on staff as an acupuncturist at the Sari Asher Center, an Integrative Oncology unit at Good Samaritan Hospital in West Palm Beach, FL granting her a unique opportunity to support patients who were either undergoing chemotherapy and radiation, or who were cancer survivors. After, Katherine was an acupuncturist at two spas and a wellness center until she decided to open her own integrative medical practice, Palm Beach Healing Arts, in early 2013. Prior to becoming an acupuncturist, Katherine received her BA in Asian religion from the New College of Florida, and also studied Buddhism, philosophy, and poetics at both Naropa University and the University of Colorado at Boulder. In addition to being a practitioner of acupuncture, herbal medicine and functional medicine, katherine also teaches Ashtanga yoga, having been a full time yoga instructor in the past. She has been a Registered Yoga Teacher with Yoga Alliance since 2002 and is currently expanding her studies to become a Yoga Therapist so she may offer an additional adjunctive modality to her work with chronic pain patients. Katherine discovered and began studying Chinese Medicine when she was 19 years old, and has been having acupuncture treatments regularly for the past 14 years. Seeing immediate benefits for stress reduction, sports injury healing, the resolution of past emotional wounds, resolution of digestive symptoms, and regulation of hormonal imbalances, Katherine was astonished at the power and breadth of this medicine. It was then a few years later on a retreat to India for a yoga immersion that Katherine felt the calling to share this powerful healing modality with as many people as possible, in order to help alleviate others suffering in a natural and compassionate way, and one that was supportive of deep healing on a mind, body, and spirit level. Katherine’s primary interest is working with women of all ages find their expression of complete health & vitality – whether supporting them to find balance in their hormonal cycles, achieve fertility, transition into and through menopause gracefully, lose weight, reclaim their energy from fatigue, or helping them to achieve their athletic goals or recover from injury, katherine works diligently to get to the root of the issue and see treatment through to wellness. One of Katherine’s specialties is in identifying and managing autoimmune diseases – autoimmunity is now the 2nd highest cause of chronic illness and affects women approximately 3 times as frequently as does men – such as hashimoto’s, rheumatoid arthritis, crohn’s, and more. Lastly, Katherine treats many diseases of the modern lifestyle, including stress, anxiety, fatigue, depression, obesity, cardiovascular disease, and more. Katherine is also certified in the Mei-Zen Cosmetic Acupuncture system which includes acupuncture for the face, neck and abdomen. Come visit our office located minutes from downtown West Palm Beach offering four spacious & relaxing treatment rooms. We are located on the 2nd floor of a two-story light green building on the east side of Dixie Hwy, North of Franklin Rd., and South of Nathan Hale. There is parking in the back of the building on the east side off of Nathan Hale and an elevator for those in need. The building name is Mariposa. Make an appointment by calling us today or clicking on the button below.